International students can enrol on the Undergraduate Foundation Programme (UFP) in Art and Design with guaranteed opportunity for progression to Art, Design, Film and Theatre degrees or our Master's Foundation Programme with pathways in Art and Design or Economics which offer guaranteed opportunity for progression to a number of Art and Design degrees or Economics degrees at the University of Reading. The department can trace its roots to 1860 and the founding of Reading School of Art. Partnered with the Institute of Contemporary Arts (ICA) and professional links with the Arts Council, Frieze Art Fair, Seoul Institute of Arts, Studio Voltaire, Tate Modern, Victoria and Albert Museum. UK #18 for Art and Design (The Guardian University Guide 2018). 100% of research was ‘internationally recognised’ in the Research Excellence Framework (REF) 2014. Facilities include: 24-hour studio, student-run art gallery, digital media suites, audio-visual studio, wood and metal workshop, photographic darkrooms. Celebrated alumni and former lecturers range from artists Walter Sickert, Stephen Buckley, and Terry Frost to Turner Prize nominees Mike Nelson, Cornelia Parker and Richard Wilson. Reading pioneered the teaching of film studies in British Higher Education more than four decades ago. Professional partnerships with AusStage (Australia), the BBC, BFI (British Film Institute), Cinemateca Brasileira (Brazil), Fujitsu, IbsenStage (Norway), and RFT (Reading Film Theatre). Ranked 5th in the UK for Film Production & Photography in the Guardian University Guide 2018. High student satisfaction – 97% for the second year running in the latest National Student Survey (NSS) 2015. Over 100 performances, films and television programmes are created in the Department each year. Purpose-built, state-of-the-art £11.4 million facilities, offering specialist production spaces and encouraging an exciting creative community. Facilities include three theatre spaces, a high-tech digital cinema, dedicated recording studio and mixing suites, a film and television studio, and suite of cutting rooms. Well-known alumni include multi-award winning musician and broadcaster Jamie Cullum; President of SyFy (formerly Sci Fi Channel) Dave Howe; award-winning film director Robin Bextor and former BBC Radio 1 film critic Rhianna Dhillon. The Department, the only one of its kind in a British university for over 30 years, was named a national Centre for Excellence in Teaching and Learning (CETL) in 2005. Awarded a distinguished Queen's Anniversary Prize in 2011 and recognised as 'a world-leading centre of typographic teaching and research'. 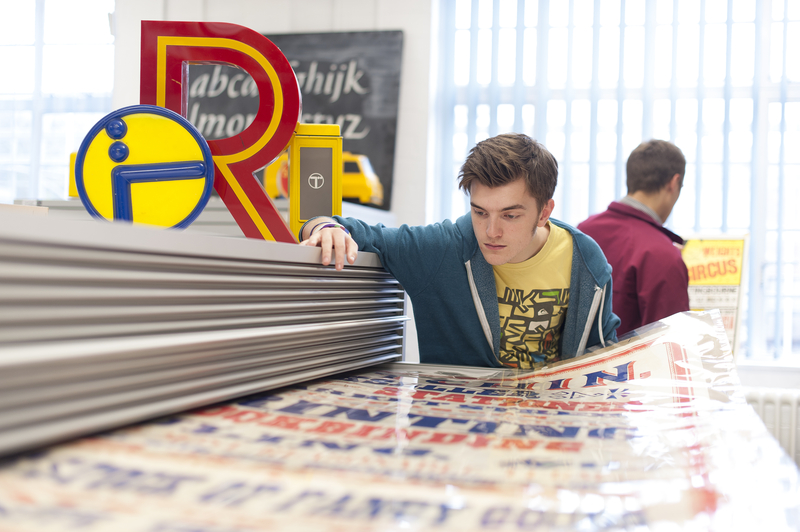 Ranked 1st in the UK for research in typography and graphic communication in the Research Excellence Framework (REF) 2014. Facilities include a commercial Design & Print Studio and Printing workshop. Unrivalled internationally-renowned collections and archives relating to lettering, printing and graphic design, including the world's largest and most significant Samuel Beckett archive. Successful alumni include the acclaimed illustrator for Penguin Books, Coralie Bickford-Smith; Paul Barnes, a renowned designer and typographer responsible for several new fonts, including the Guardian newspaper; Vincent Connare, a former Microsoft employee who created the Comic Sans and Trebuchet MS fonts; and Designer Malcolm Garrett who has worked for music artists such as Buzzcocks, Duran Duran, Simple Minds, and Peter Gabriel.